» Business notes: Where’s that store? Business notes: Where’s that store? Exactly where is “Waverly Drive & Geary Street” in Albany? In the business department, there are some items to take note of around Albany. A nationwide chain posed a small puzzle before opening a local branch in the city’s commercial center this week, and on a smaller scale, storefronts are being put to new use in the old part of downtown as well. 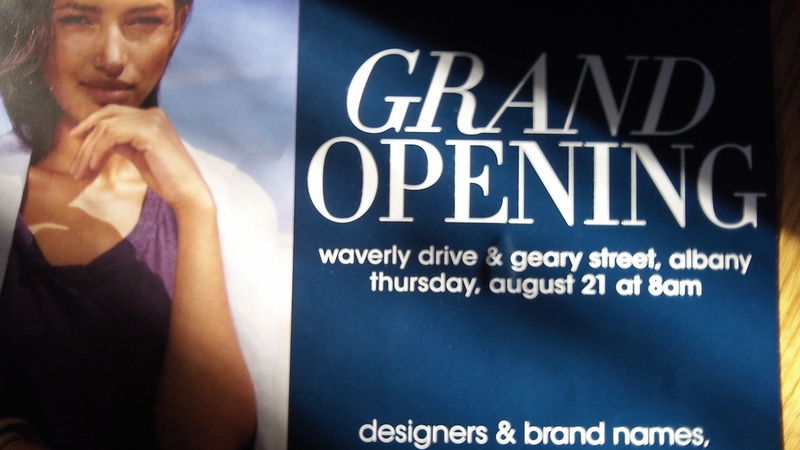 — Sunday’s paper included a one-page glossy insert, almost but not quite lost in the pile or other ads, announcing the grand opening of Marshalls this Thursday, Aug. 21. But if you don’t know where it is, or that it occupies part of the remodeled former GI Joe’s on the south side of 14th Avenue, near Safeway, the ad might have you scratching your head. 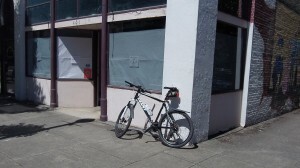 “Waverly Drive & Geary Street” is the location listed in the ad. These are parallel north-south streets, and you may recall from elementary geometry that parallel lines meet only in infinity, if ever. (Waverly and Geary come together only at the north and south poles.) The new branch of this discount chain fills a space that had been empty for a few years. The rest of the building is to be a Big Lots. No word when that will open. A café named “Sirene” expects to open here in September. Now that the national economy continues to show real growth occurring, the investments that Albany made to rehabilitate the blight that used to be downtown now provide ripe opportunities for investors. Even though downtown investment grew during the worst recession of out lifetimes, it is now poised for even more rapid growth and investment. The next inevitable step is to listen to Gordon Shadle whine about creeping communism and what a disaster this is for Albany. Or maybe Jim Clausen can revisit his prior claims that the city council was in cahoots with the United Nations to take over the city. Or even Tom Cordier, who specializes in telling others why their decisions are wrong and only his are right, will advise the Novak family to switch to Mexican food. The time is over for the naysayers and malcontents who have worked to divide Albany and stop progress. The time is NOW for the business investors who see opportunity and those that care about building an even better Albany for the future to move forward together. 4 potential businesses moving into downtown Albany. 2 will probably fail and 1 (dental office) eventually move, but that’s enough to attack 3 people?